This is the most sheltered of all our winter walks. We walk around what became known as Albertoplis, where the Great Exhibition took place, and where the V & A, Science and Natural History museums and the Royal Albert Hall were all built. 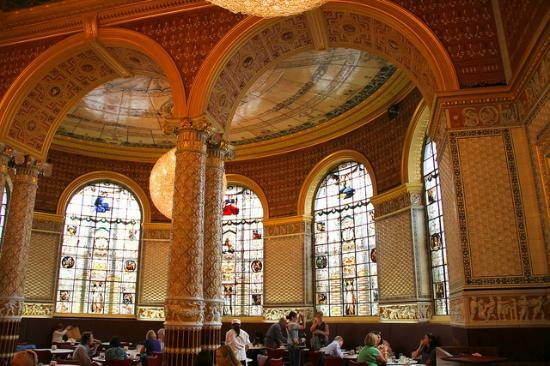 We see all of these historic imposing sights, and pop into the V&A to show you the world’s first and, still to this day, probably most beautiful museum cafe in the world (see above photo). We can stop for a cuppa while we take in the beautiful surrounds if you wish. We can also guide you round some exhibits here, or if you prefer seeing The Rocket or a T-Rex to a Rodin, we can pop in the science or natural history museum too. And all these museums are linked by underground walkway so if it’s a cold or wet day we spend very little time out in the elements. But if it’s a lovely day we can change the itinerary and take you into pretty Hyde Park to show you Rotten Row and where the Great Exhibition took place.